Originally appeared in the Cherokee Phoenix, July 2012, page 7. 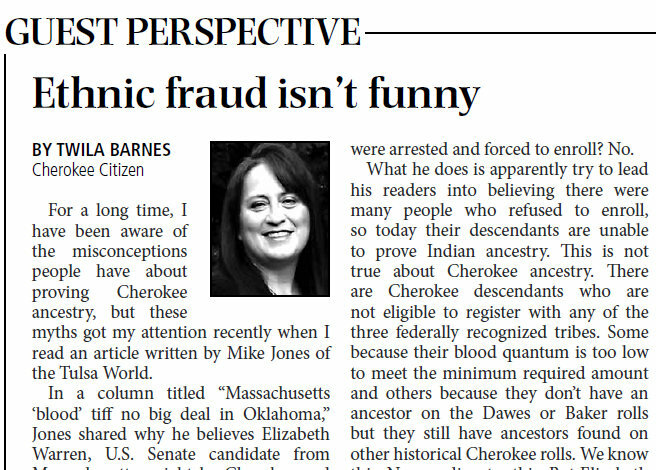 For a long time, I have been aware of the misconceptions people have about proving Cherokee ancestry, but these myths got my attention recently when I read an article written by Mike Jones for Tulsa World. 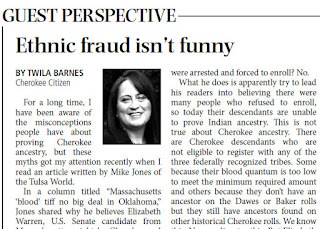 In “Massachusetts ‘blood’ tiff no big deal in Oklahoma,” Mr. Jones shared why he believes Elizabeth Warren, US Senate Candidate from Massachusetts, might be Cherokee and why her lack of proof is, in his opinion, not a big deal to residents of Oklahoma. Mr. Jones believes “Proving Indian heritage is not easy,” because “You have to trace your roots back to the Dawes Rolls.” He said “there were a lot of Indians in Oklahoma who simply refused to sign.” Though these are common beliefs, they are not supported by facts. Did Cherokees refuse to enroll? Yes. Were they enrolled anyway? Yes. Does Mr. Jones bother to tell his readers this? No. Does he tell his readers that some Cherokees who tried to avoid allotment were arrested and forced to enroll? No. What he does is apparently try to lead his readers into believing there were many people who refused to enroll, so today their descendants are unable to prove Indian ancestry. This is not true about Cherokee ancestry. There are Cherokee descendants who are not eligible to register with any of the three federally recognized tribes. Some because their blood quantum is too low to meet the minimum required amount and others because they don't have an ancestor on the Dawes or Baker Rolls but they still have ancestors found on other historical Cherokee rolls. We know this. No one disputes this. But Elizabeth Warren is not one of these people. Why didn't Mr. Jones point out the many other rolls and records of the Cherokee people like the Emigration Roll, Henderson Roll, the Drennen Roll, the Old Settler Roll (two of them), the Guion Miller Roll, the Chapman Roll, the Siler Roll, the Lipe Roll, the censuses of 1869, 1880, 1890 and 1896? Or the muster rolls of Cherokee soldiers from the War of 1812 and the Civil War? Or the Moravian and the Brainerd Mission records? Or the muster rolls from the removal? Or the ration lists from before and after the removal? Or the claims the Cherokees filed against the US in the 1840s? Why didn't he point out the fact that Elizabeth Warren's ancestors are found on none of those rolls or in any of these records? Ms. Warren claims to be Cherokee through her Crawford line. The genealogy of that family has been traced back 188 years, fourteen years before the forced removal. There is no indication of Cherokee ancestry. The family is listed as white on every record. The family did eventually move into Indian Territory in the late 1800s at the same time many other non-Indian families moved in – shortly before allotment when they hoped to get cheap land from Indians. Mr. Jones, more than once, tries to say that being born in or being from a family with a history in Oklahoma probably means one has some Indian ancestry. He claims that it is unusual to find an Oklahoma native who doesn’t have Indian ancestry. Nothing could be further from the truth. There are many families who have a long history in Oklahoma, going back years before statehood, but have no Indian ancestry. In truth, these families are very likely non-Indian because the number of intruders, or people illegally squatting on Indian land, exploded during the two decades before statehood. By 1890, there were 128,000 non-Indians living in Indian Territory compared to about 50,000 Indians. By 1907, ninety percent of the population was intruders. Though Mr. Jones cites a colleague’s “high cheekbones” as enough proof for him, despite her lack of “paper,” and though he says “the kerfuffle…..over….Warren's alleged Indian heritage seems pretty silly”, I disagree. Dishonesty is not silly. It is a problem. Ms. Warren is a lawyer, a law professor, and should know the burden of proof falls upon the claimant. She knows there is no documentation to support her claim of Cherokee ancestry, yet she continues to insist she is “Native American.” It is unfortunate that Mr. Jones tries to speak for “us way out here in Oklahoma” and says “the Indian brouhaha is laughable.” Apparently he didn’t ask a lot of Cherokees what they thought about Ms. Warren and her false claim, because ethnic fraud isn’t funny to us and we aren’t laughing. I know this is an older post, but I wanted to share my experience. Having grown up in Oklahoma, I always thought I was part native American. When I moved away in my early 20s (to Arkansas!) I was surprised when people would talk about their lineage and not mention their native ancestors. The concept was just so foreign to me. I think it was in late 2011 that I went on a quest to prove my Native American heritage. And, I'm pretty sure (this is hard to admit) that I don't have a single native American ancestor. My maternal great-great grandpa is absent from this historical record until he married my great-great grandmother. So, he might be the one. But, I don't know. He thought his father was born in Virginia, so maybe not. Giving up the belief that I have native American ancestors hurts. I haven't given up completely, but I've given up mostly. I don't know the whole story with Elizabeth Warren, but when I realized she was from Oklahoma, I felt like I understood where she was coming from. This to is a new post on an older Blog regarding this subject. But, I sure would like to know how to find out with any certainly, where, who, or how, I come up with an 18% Native Ancestry on a DNA test? It would seem to me, this is not so easy to prove, or dis-prove, and I would really appreciate any guidance on this subject. I completely understand Ms. Barnes sentiments on "Warren" she is a fake, Imposter, and the whole "act" she puts on is hard to look at! But, from my viewpoint, ( and I know I don't have required 24% to be a part of any tribe, but suspect strongly, that my elderly Mother does) that is NOT my goal. I would simply like to know who my ancestors really were. I have found very little information using "ancestry.com" in any of my heritage research. I can't seem to find much in the way of proof from any direction? Does Ms. Barnes, or anyone else do this type of research for others? Perhaps this is the way I need to go? Please do advise me, if you can. Thank you.